At Volumetric Technologies, we provide top-of-the line Rotary Cup Filling Machines that are designed and manufactured in the United States. Our Rotary Cup Filling Machines are suitable for many industries including food, dairy, and cosmetics and designed to meet your needs to fill, denest, seal, and lid products into stackable containers. 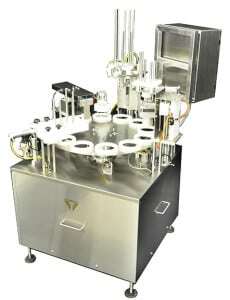 Depending on your workload specifications, particularly your container, product, and seal type, our fully automatic Rotary Cup Filling Machines can fill up to 50 cups per minute per lane, are made from FDA/USDA approved stainless steel and are suitable for containers ranging from 1oz to 6lbs. How Do Our Rotary Cup Fillers Function? 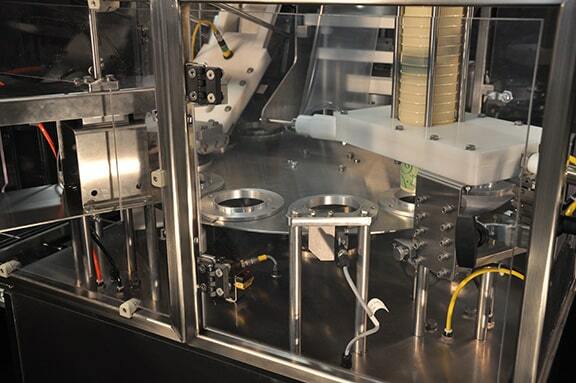 Volumetric Technologies’ Rotary Cup Fillers use a vacuum-assisted cup denester to deliver the cups to carrier plates where they are then indexed to a filling station to be filled with liquid or dry products. Your choice of seal is then secured onto the product and the container is indexed to the lid station where a lid is applied if necessary. Finally, the finished container is automatically ejected to a transfer plate or take-away conveyor. All Volumetric Technologies’ Rotary Cup Fillers are customizable, designed specifically for your business’ workload and will fill and seal your products with efficiency and impressive results. All of our machines are equipped with a PLC solid state controller and are servo driven for complete flexibility, precision and speed with easy configuration for your products and containers. They also come equipped with touch screen operator interfaces that have menu driven controls for ease of use and adjustability. We also provide two filling options for your Rotary Cup Filler: Piston which provides the highest product fill accuracy, with the lowest level of product degradation or Servo Rotary Pump which is ideal for liquids and liquid type slurries with smaller particulates. The entire line of Volumetric Technologies’ cup filling machines come equipped with advanced design features to guarantee that your products are packaged to your specifications every time. If you’re looking for the highest quality cup filling machine in the industry then look no further than Rotary Cup Filling Machines from Volumetric Technologies.